After yesterday's nightmare today was a straightforward 230km on good roads. A welcome relief. The scenery was fantastic. Wide valleys grazed by herd of yak and goats. High mountains either side with the shadows of clouds dappling the sides. Toward the end of the day we passed Mount Kailash, a mountain holy to Buddhists and Hindus. The almost perfect pyramid shape is usually hidden by clouds but poked its head out for us. It is said that the four great rivers of Asia flow from its four sides. The mountain is a point of pilgrimage as is the lake we are staying by tonight. 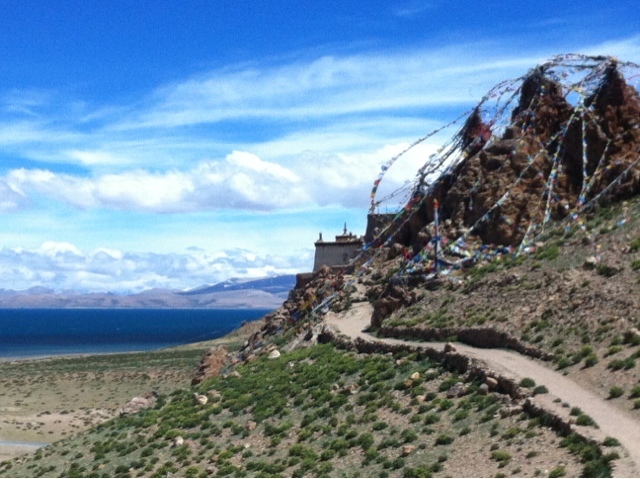 Perched on a rocky outcrop between the two is a tiny Tibetan monastery. A more desolate but peaceful place you could not find.